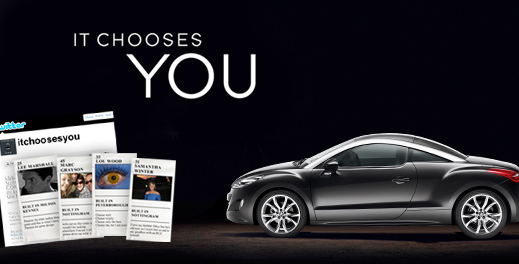 Why Baudrillard would have liked the new campaign for the Peugeot RCZ: ‘It chooses you’. The new ads for the Peugeot RCZ reverse the usual relationship between consumer and product, showing the car choosing the driver rather than the other way around. For Baudrillard, this is how things are. Our power to choose is an illusion: we’re just the playthings of the objective world. Irony belongs not to us but to the objects around us, which pretend to be mute and passive, but secretly know they have all the power. And because objects have all the power, we’re wasting our time thinking we can stand outside them and uncover their meaning through critical analysis. The only radical way to find their truth is to submit to them, losing ourselves in their logic and obeying their every whim. By ‘advertising themselves’ to the Peugeot RCZ and begging it to choose them, drivers are adopting what Baudrillard called a ‘fatal strategy’: an attitude of submission to the objective world. He saw fatal strategies at work in many cultural phenomena: obesity and long-distance running, to name but two. Both represent the end of the subject’s critical, negating power – its ability to choose, stop, and say no. These forms of hyper-passivity are far from futile or meaningless. For Baudrillard, only by obeying the world will we find out what it is – not by critiquing from a distance. In a way he’s saying we should take the world literally: obey every ad, follow every instruction, say yes to everything, and then we may start to understand. >I think Baudrillard would have liked the idea of an artificially-created distance and silence as a corrective to an over-connected and over-communicating universe. Thanks for your comment and links, Josh. Interesting to think of Baudrillard in terms of PKD – the Ubik door is definitely a totally Baudrillardian object, mocking the human with its superior irony (the Cheshire Cat in Alice in Wonderland is another!). Another science fiction reference that makes me think of Baudrillard is Lem’s story The New Cosmogony – with its idea of a universe based on a ‘pax silentia’, in which the planets agree to create a barrier of distance and silence between them, in order to preserve peace. I think Baudrillard would have liked the idea of an artificially-created distance and silence as a corrective to an over-connected and over-communicating universe.